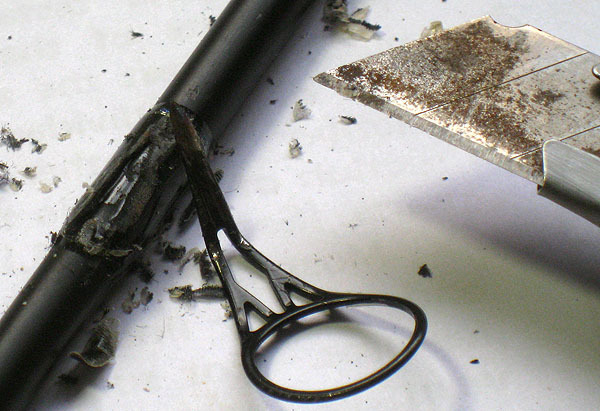 There comes a time as an angler(assuming you stay in the hobby long enoug for this to happen) when one or more of your rod guides needs replacement. 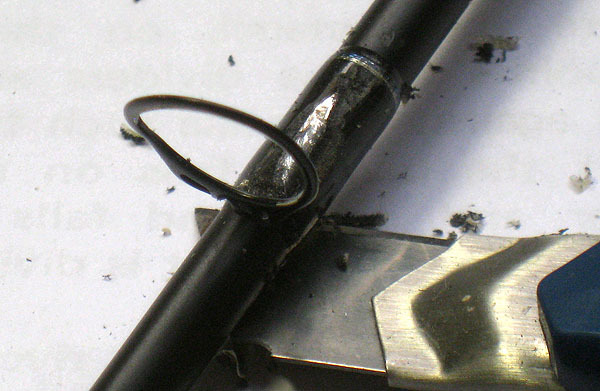 It could be due to many reasons, but the most common reason is because the ceramic ring on the guide has either cracked or chipped or "pop" off due to impact, other times the mental guide holding the ring might have just rusted away. 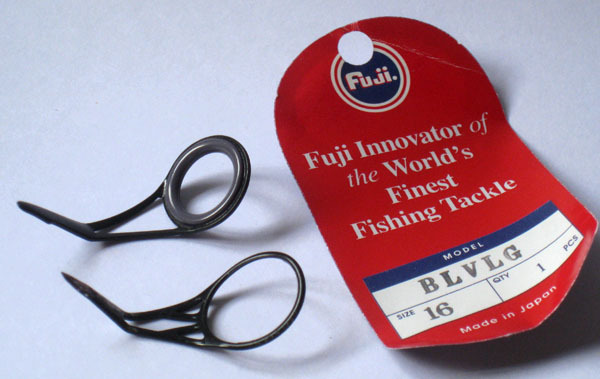 If the guide you need to replace is the tip(the first guide at the tip of the rod blank), the process might be rather simple and most tackle shop would gladly replace it for you if you purchase the tip from them. For rod tip replacement the most important part of the replacement process is knowing the diameter of the tip of the blank of your rod. Rod tips comes in different diameters to fit the tip of different rod blanks. 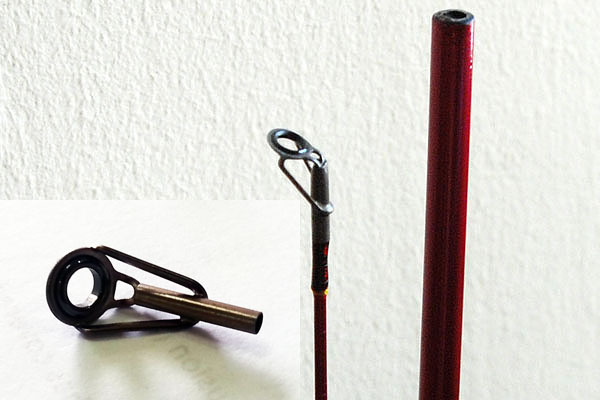 If unsure, bring along your rod to the tackle shop when you need to replace the tip. This way the shop assistant can pick one for you that fits the tip of your rod. If the guide you need to replace isn't the tip, then that's where the problem starts. Generally the rod I use are below a $100. A guide replacement would cost me at least $4 to $8 for the new guide and at least $10 to $15 for the work to do the replacement, and that is if I can find a tackle shop that's willing to take on the job. As such, a guide replacement job would put me back at least $25 to $30, that's at least 25% of the cost of the rod. I will need to send the rod in for repairs and collect it when it's done, moreover I will be at the mercy of the tackle shop as to when it can be completed. That's a lot of time, travel, cost and not to mention stress tied to this process. So one day I decided that a more economical and permanent solution to this constant problem is that I have to learn to do it myself. I always though guide replacement would be a rather complicated process but after gathering some tips from some fellow anglers and following the guides on the internet, I learnt that it not so hard after all. To be honest my workmanship is far from good but knowing how to do it myself solves tons of problems I mentioned above, it give me a sense of pride knowing that I fixed my own rod when I use them. Cosmetically, I would say my fixes would just barely meet the mark, but functionally I haven't lose any guides due to my workmanship....yet. Disclaimer : The instructions here are for a quick and dirty fix to guide replacement. The steps I have taken to get the job done do not follow any "best practises" nor the "science" of guide placement etc, etc. The objective here is to get if fixed and go fishing. So you have been warn ;). So, here it goes. 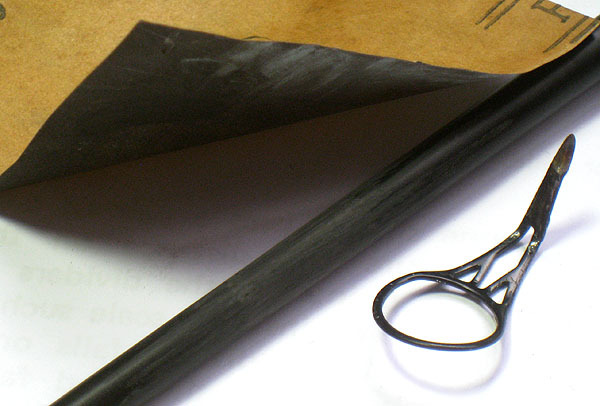 The first step in replacing your rod guide is to go out and purchase a new rod guide. I try to get an exact replacement as much as possible but sometimes that is just impossible, so in such situation I try to get one with the nearest fit and with the same height or the original. The height of the guide is measured from the feet to the the top edge of the guide. 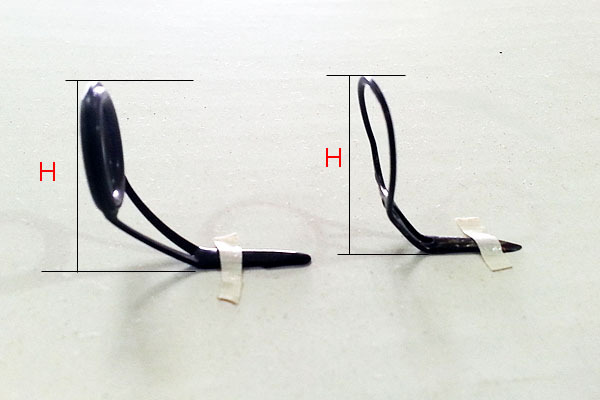 In the image above the height is represented with the letter "H", do note that guides come with a single foot or a pair of feet. In this example I am using single foot guide. The first part of this process is removing the old guide from the rod, the guide is held in place on the rod with thread and epoxy, to remove the guide we need to cut through the harden epoxy and cut the thread holding the guide to the rod. To do that I simply uses a cutter or a pen knife and some sand paper. I usually begin my cut from the foot of the guide. Knowing that the foot is metal I can slice away at the epoxy all the way to the base to the foot and not worry that I might scratch and injured the rod blank. Slice off all the epoxy and thread on top of the foot. Once you have slice off all the epoxy and thread on top of the foot of the old guide you should see something as shown in the image above. When you reach this stage, you could easily pull out the spoilt guide from it's position. 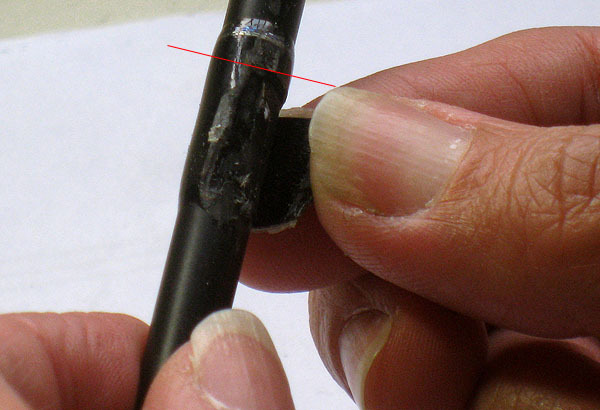 If it's not coming out easily, you might need to remove more of the epoxy and thread holding it in place. Once it's out it should look something like the image immediately below. When the old guide is removed, it will leave a gash and with the gash you should be able to see the rod blank below which the old guide sits. From here, I try to use my finger nails to peel of the remaining thread wrapping the blank. Usually it comes off quite easily but other time I still need the aid of the cutter blade. 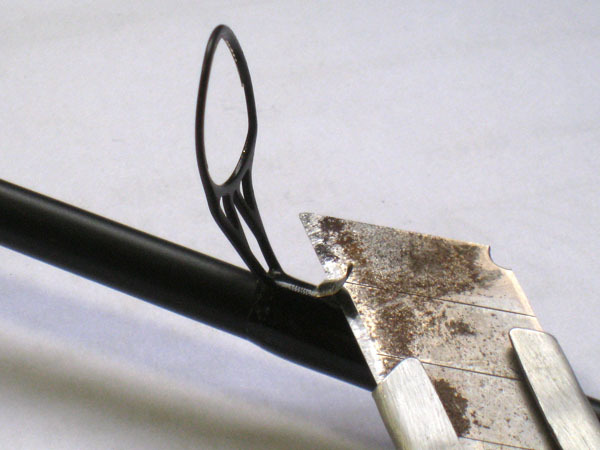 If you need to use the blade, you must be careful not to scratch the blank when you peel the remaining thread off. As you can see the blank and the depth of the epoxy plus thread you need to remove, you should be able to scrap them off without much effort. 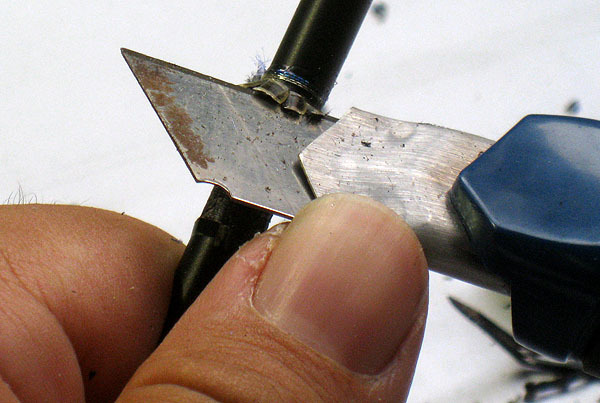 Below is an image of me using my nails to peel off the epoxy and thread around the cut. After removing the thread and epoxy around the gash, the nex part is to remove the thread and epoxy below the cut. For that I use the cutter and gently slice of the remaining thread and epoxy taking care not to scratch the blank as much as possible. Below is an image of my attempt at slicing off the remaining thread and epoxy. After all the slicing and scratching, you should be able to get all the old thread and epoxy holding the spoilt guide off the rod blank. 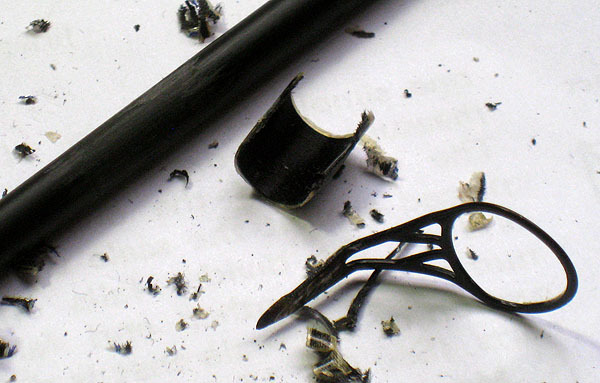 The image below shows the state of my rod blank after I removed everything. To smoothen the surface of the blank and to make sure that I get all the old epoxy off the blank, I give the blank a sanding with a very fine grain sand paper. Once it's smoothen and clean with a clean cloth, it's ready for the next stage. That's the fixing and gluing back of the new replacement guide. Below is an image of the blank after I have sanded and cleaned it. Thank you for reading. Please continue to read part 2 of this article (which will be out pretty soon).